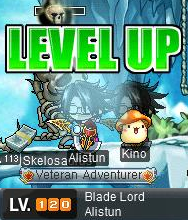 It was not long since the release of Dual Blades that I was able to reach lvl 120. This goal was reached much quicker than I had thought. I've been preparing for this job for a while now. 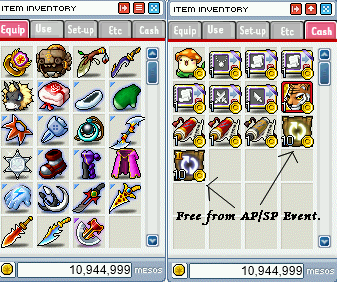 It was very expected that Nexon would include NX skill mastery books, so I MTSed a lot of maple daggers to have enough nx to buy them. Below are pictures of the some of the equips and nx I had prepared on my Dual Blade. All of the equips were self scrolled and some makered. 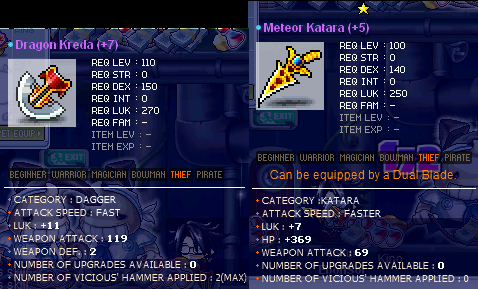 ^_^ I didn't want to spend much money on weapons or equips, so I makered most of them, like the Lvl 100 Katara. For the Attk gloves, Shoes, and Cape, I reused from my other characters. I know that a lot of you guys are wondering if I had to play all day to reach Lvl 120 in this short amount of time. My answer would be no. I bought one of the ten day 2x EXP cards, so I usually trained during those 4 hours of 2x EXP. And on the weekends, there were two 2x EXP events that lasted 2 hrs each and I trained during those times. So everyday is 3 -4 hrs of 2x EXP and on weekends are the additional 2 hours from the 2x EXP Event. Of course during the training process, I used 2x EXP Family Buffs, a Ring Mule, and Holy Symbols to speed up the training. How many levels per day? After reaching Lvl 120, I'll probably take a break from training. I will be updating the Dual Blade Training Guide soon because I've noticed some of the training spots are not efficient at some levels. Wow thats epic im training hard for lvl 50 but i dont think cpq is the fastest way help me please. 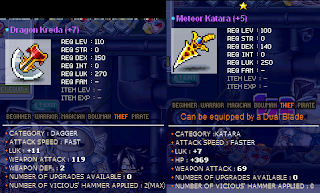 And yes, please update your Dual Blade Guide. And you said you can get free pets and stuff if you subscribe to newsletter? How do you subscribe to it and what do they send to your email? Umm.. when are you planning to cap your DEX ? Oh and I agree with the 2 Anonymous's Post Above, even though Im not them, So make the mesos guide, and guide for nexon newsletter (free nx items/pet), and when are you Capping Dex? For the Newsletter question, I signed up when I created my account. While creating the account, they gave me the option of subscribing. There's a link in the front page of Nexon.net (bottom left), that say's Nexon Newsletter. Click on that, and then click on "Go to your account settings for the Newsletter." I think you need to be logged in to be able to sign up. *The 'free' nx items are usually given to inactive accounts. I capped my DEX at 103 dex, which is a little too much. But I don't really mind because this way I can wear Lvl 120 armor. @Alistun, so wait, I remember in a video of yours, in the desc. box, you said something about you get pets and like 2x exp cards if you subscribe to the nexon newsletters? Well do you? If you do, when do they send the item (code) for the nx item? WOOOT! JUST GOT 120 THANK YOU SOOO MUCH FOR THIS GUIDE IT ROCKED! did you max tornado spin? how about flash jump and flashbang?? What's the name of the song/tune you used for this video?? how did you get the tiger? How did u like combine flying assaulter and tornado spin?Like after the flying assaulter when u used the tornado spin it like gave a little burst of blue.So how the heck did u do that?